With the Bloomsbury Raised Planter with Trellis you'll be able to enjoy nature's beauty anywhere you choose; train flowers up to attached trellis to create a beautiful, natural privacy barrier; or double the vegetable yield of your raised planter, by training vegetables upward. The perfect solution for limited mobility or limited space, with the Bloomsbury Raised Planter with Trellis. You'll be able to grow perfect flowers and vegetables with less weeding, less pests and no soil compaction. Attractive enough to compliment any outdoor setting, the Bloomsbury even has a shelf to store pots, soil and gardening equipment. A solid choice for durability and function. This raised garden bed is strong, long and perfectly square. Reinforced with bracing boards to prevent frost push-out or any disturbance from mowers or rambunctious children and pets. Classic White gardens really pop in your garden and accent traditional home styles. The 8-inch-high stacked side boards give you lots of depth to grow both underground veggies, as well as tall plants. As shown, your 4 ft. x 12 ft. x 8 inch raised garden bed provides 48 square feet of planting area. You can redesign your garden at any time by assembling your available boards and brackets in new ways. Each modular kit includes eight of our 1 inch Classic White composite boards and eight 1" stacking brackets. The insulating open-channel boards trap air, providing insulation to your soil. Keeps soil warmer in the Spring and Fall, and cooler in the Summer, so you can grow for an extended period. 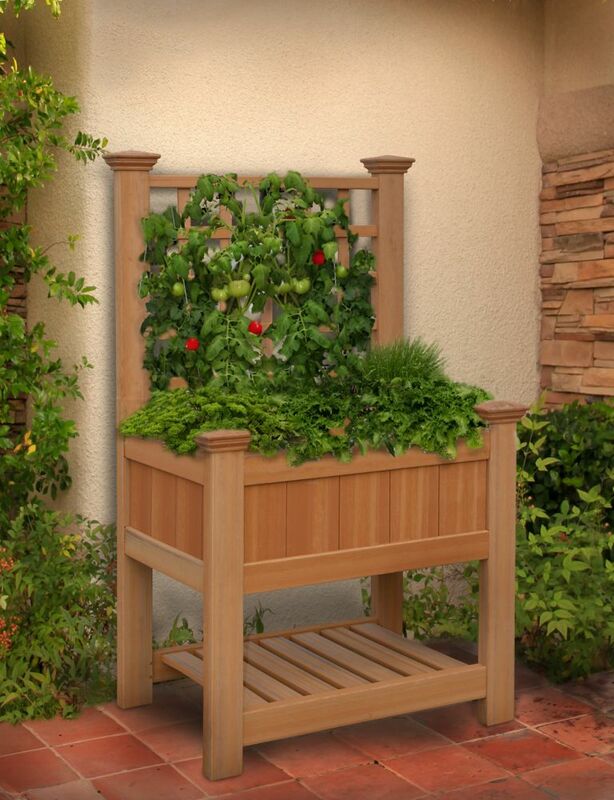 Our Raised Garden Bed Brackets pivot 270 degrees, allowing endless design options. Calling all hobby farmers! This enormous raised garden bed gives you loads space to neatly organize a variety of vegetables, herb, fruits or flowers. As pictured, your 8-inch-high raised garden gives you lots of depth to grow both underground veggies like carrots, radishes and turnips, as well as tall plants like tomatoes, corn or sunflowers. With 64 square feet of available planting area this may be all the garden you will ever need. Classic White gardens pop in your garden and accent traditional home styles like Colonial and Cape Cod. Each modular kit includes eight of our 1 inch Classic White composite boards, and eight 1 inch stacking brackets. The insulating open-channel boards trap air, providing insulation to your soil. Keeps soil warmer in the Spring and Fall, and cooler in the Summer, so you can grow for an extended period. Our Raised Garden Bed Brackets pivot 270 degrees, allowing endless design options. Looking for a small garden that delivers on looks, functionality and flexibility? This two-level raised garden bed has got you covered. As pictured, your 11-inch-high raised garden gives you lots of depth to grow both underground veggies like carrots, radishes and turnips, as well as tall plants like tomatoes, corn or sunflowers. With 16 square feet of available planting area this is a great starter garden for you to build on. Tool-free snap-lock joints make it simple to install.Your kit comes with everything you need except the soil and plants. Each modular kit includes eight of our 2 inch Classic Sienna composite boards, and eight 2 inch snap-lock stacking brackets. The insulating open-channel boards trap air, providing insulation to your soil. Keeps soil warmer in the Spring and Fall, and cooler in the Summer, so you can grow for an extended period. Stacking brackets allow you to install the second layer of your garden just by inserting the stakes into the brackets below. Bloomsbury Composite Raised Garden Bed with Trellis With the Bloomsbury Raised Planter with Trellis you'll be able to enjoy nature's beauty anywhere you choose; train flowers up to attached trellis to create a beautiful, natural privacy barrier; or double the vegetable yield of your raised planter, by training vegetables upward. The perfect solution for limited mobility or limited space, with the Bloomsbury Raised Planter with Trellis. You'll be able to grow perfect flowers and vegetables with less weeding, less pests and no soil compaction. Attractive enough to compliment any outdoor setting, the Bloomsbury even has a shelf to store pots, soil and gardening equipment. Bloomsbury Composite Raised Garden Bed with Trellis is rated 5.0 out of 5 by 2. Rated 5 out of 5 by Tony from Great product. Easy assembly and sturdy. With a 10 year... Great product. Easy assembly and sturdy. With a 10 year warranty, I’m expecting it to hold up outdoors. Rated 5 out of 5 by Valerie from Easy to assemble Great for a raised bed - no bending. All the pieces were there and the vinyl does look like wood.